How to schedule an appointment outside your business hours. By default, Setmore won't allow you to schedule an appointment outside your normal business hours. However if you want or need to, you can activate off-hours booking, which will allow you to schedule appointments anytime regardless of your business or staff working hours. Note: only account admins may activate off-hours booking. If you are a staff member, please contact your account owner to activate this feature. When scheduling an appointment in the Setmore mobile app, you will notice that the app only permits you to book the appointment during your normal working hours. 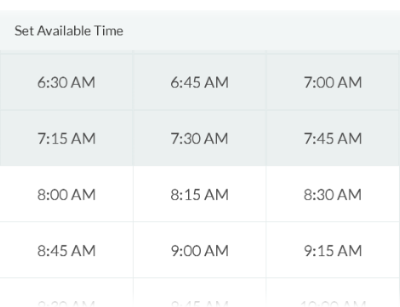 By activating off-hours booking, you'll be able to schedule appointments anytime, day or night. Start by going to Account > Settings. Scroll down to the Off-Hours Booking feature and tap to turn the switch to the On position. 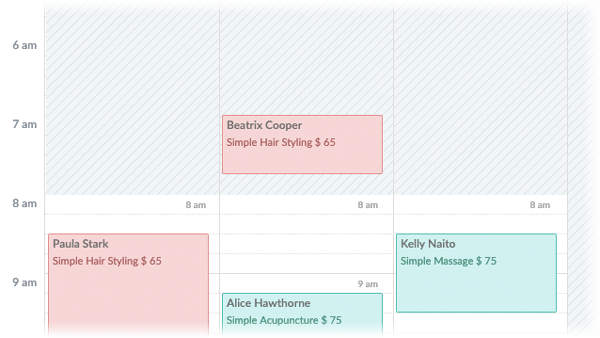 Now when you book an appointment, you'll be able to select any time slot you want. Available times outside your normal working hours will appear in grey, but you may select and book them as needed. Watch the video or follow the instructions below to activate off-hours booking. Start by clicking the Settings icon in the top right corner of your calendar, below the Profile button. Next, click "Activate off-hours bookings" to activate the feature. You'll see a yellow pop-up message at the top of the browser window that confirms that activation. You should now be able to book appointments outside your normal working hours. Simply click anywhere on your calendar in the grey area to start booking the appointment.